NSW has around 1900km of coastline. The marine environment extends from the intertidal zone to the vast waters of our surrounding oceans, and includes a range of habitats such as the water column, the continental shelf, beaches, rocky and coral reefs and seamounts. The coastline of NSW is around 1900km and consists of 33% rocky shores, 65% sandy shores and 2% muddy shores. These environments provide important feeding, spawning and nursery sites for many fish. Rocky reef refers to all areas of rocky outcrops or boulders occurring within marine and estuarine waters below the highest astronomical tide level. 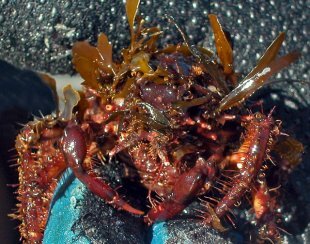 Macroalgae and invertebrates contribute to the physical structure of rocky reef habitats and are therefore considered part of these habitats. Rocky reefs support hundreds of species of invertebrates including sponges, sea squirts and corals. Some groups of species such as barnacles, sponges and kelps are attached to the reef and are commonly distributed in particular areas, while other species such as fish can move between many marine habitats. 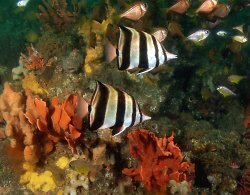 The reefs provide refuge and feeding opportunities for a wide variety of fish. Small fish can escape predators among caves and crevices, while carnivorous species, such as black cod and bream, can use the rocky habitat as cover to ambush their prey. Algae are important food and shelter for a large range of fish and invertebrates, and are used as shelter by hundreds of other aquatic animals and plants. Algae attached to the sea floor are generally called seaweeds. Seaweeds are found at shallow depths where light can penetrate, and large brown kelps, such as Ecklonia radiata, are commonly found in water depths from low tide to 20m. Dead algae and seaweeds (known as “wrack”) which drift in the water also serve as food and shelter for fish and invertebrates, such as abalone. Coral reefs are found in the warmer marine waters of northern NSW while rocky reefs are distributed along the whole coast. Coral reefs extend as far south as the Solitary Islands and Lord Howe Island Marine Parks. The coral reefs of NSW are the most southern coral communities in Australian waters and they are not considered true “reef communities” as they do not form limestone accumulations. These coral communities provide habitat for a range of plants and animals including seaweeds, sponges, fish, worms, sea squirts, sea stars, crustaceans and molluscs. Rocky and coral reefs in NSW are susceptible to pollution from land-based activities including agriculture and urban development and sewage overflows. Dredging can also cause sedimentation which may smother near shore reefs. Recreational and commercial activities such as fishing and SCUBA diving can also harm these sensitive habitats. The Seaweed Decorator Crab (Notomithrax ursus) is a very unusual looking crab species that belongs to the Spider Crabs (Family Majidae). This species is common along the south-east coast of Australia however it is seldom seen as it very well camouflaged with its algae covered body. It can be found in the coastal waters of New South Wales, Victoria and Tasmania and is generally found on intertidal reefs in shallow water. Spider crabs are characterised by triangular or occasionally rounded shells that are covered in spines, hairs and knobs. The crabs use their claws to camouflage and decorate themselves by attaching algae or sponges to their hairs. Once attached the ‘plant’ grows on the body of the crab. Seaweed Decorator Crab (Notomithrax ursus). Rocky shores are unique habitats shaped by a combination of waves, tides and the type of rock present. They support a diverse mix of plants and animals which have adapted to survive the changes in exposure to water, sunlight and wind that characterise this habitat. Rocky shores are important fish nurseries. The commercially important fish found around rocky shores include blackfish, yellowfin bream, snapper, tarwhine, trevally, yellowtail and samson fish. Rocky shores might consist of platforms, boulder fields and rock pools. Each provides habitat opportunities for different types of plants and animals … and each presents its own challenges for survival. Many animals and plants live on rocky shores in the intertidal zone, the area between high and low tide. To live in the intertidal zone the plants and animals must be able to cope with problems of two environments. They are pounded by waves, exposed to extremes of temperature and salinity, and flooded by sea water and exposed to drying air twice every 24 hours. They also have to avoid being eaten by birds, molluscs and crabs at low tide, and by fish and other marine life at high tide. Surviving these conditions takes special adaptations. Some animals avoid drying out by moving, burrowing or hiding under rocks and pool ledges. Most of those that are attached to the rocks and cannot move close their valves tightly until once again covered by water. Others are camouflaged and avoid predators by seeming to be something else. 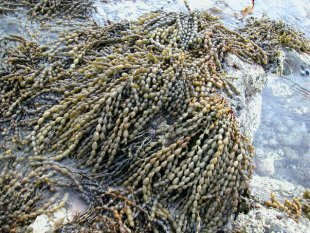 Macroalgae are members of the huge group of aquatic plants know as algae. The algae are primitive photosynthetic plants that include single celled ‘phytoplankton’and the multi-celled macroalgae, or seaweeds. Macroalgae should not be confused with seagrass. Neptune’s Necklace (Hormosira banksii).This species is restricted to the lower intertidal zone where it is subject to strong wave action. It attaches itself to rock by spherical or cylindrical segments and after violent seas masses of the necklace can be found washed up on the shore. Photo: David Harasti. Sandy and mud beaches occupy a dynamic position between sea and land. They are characterised by a large number and diversity of animals such as crabs, pipis and worms, living in or on the upper sand layers. A large number of microscopic animals live between the sand grains. 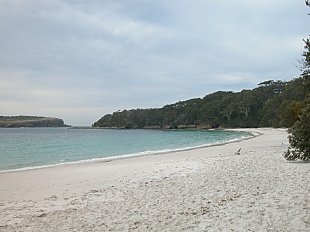 Sandy beaches are some of the most common habitats along the NSW coast. Beaches often appear unproductive but are home to a large number of species including burrowing worms, crabs, yabbies and other shellfish. These invertebrates are a major source of food for many fish species such as flathead, flounder and whiting. Beach adjoining a rocky shore on the headland. Photo: Allan Lugg. Sponges, hydroids and anemones, sea pens, sea whips, tube-building worms, bryozoans, barnacles, ascidians and soft corals are the major groups of animals in sponge garden communities. These habitats flourish in shaded or deeper water as they are not dependent on sunlight as algae and seagrasses are. Not only do sponge gardens provide habitat for other animals they are an important part of nutrient cycles in marine systems - filtering out particles and nutrients from the water as they feed. Like all temperate life forms in the waters of southern Australia the habitat forming invertebrates in sponge gardens rely on clean water and sufficient nutrients and food particles to survive. Because many of the animals are permanently attached to the rock and unable to move around, they cannot go in search of food or flee from harm. 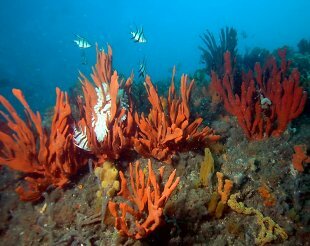 Sponge gardens are made up of delicate creatures and many are very slow to grow - some living for decades. These factors make sponge gardens susceptible to physically damaging processes such as storms and human activities such as trawling and dredging. Over 70% of the Earth’s surface is ocean, yet we know little about the life and habitats within the open ocean. Even in the best known regions, very little of the seafloor has been mapped. The open sea is the largest of all habitats and it is the least hospitable, being very cold, very dark and subject to extreme pressure. Habitats range from deep-sea rocky reefs and ridges, sand flats and temporary habitats created when a food source (like the carcass of a dead whale) sinks to the sea floor.